The triumphalism is more a manifestation of conservatives’ wishful thinking than a reflection of any objective reality. On Tuesday, Wisconsin Governor Scott Walker held onto his job with a typical Republican campaign built on trickery, wildly dishonest messaging and a massive budget courtesy of a handful of ideologically like-minded sugar daddies from out-of-state (according to Mother Jones, about two-thirds of Walker’s donations came from outside the Badger State, compared with just around a quarter of his opponent’s). In the aftermath of the vote, conservatives, proving typically magnanimous in victory, spun the results like a top. They claimed the outcome spelled doom for Obama this fall, marked the death of the labor movement and was a pure reflection of voters’ love for Scott Walker’s economy-crushing austerity policies. We shouldn’t kid ourselves; it was obviously a serious defeat for the progressive movement. Yet the triumphalism is more a manifestation of conservatives’ wishful thinking than a reflection of objective reality. Here are eight reasons why. An honest reading of the published exit poll leads to an important conclusion about Walker’s victory that has little to do with unions, Walker’s policies, the economy or any of the other factors that have pundits’ tongues wagging. Fully 70 percent of those voters polled believed that recall elections are either never appropriate (10 percent) or are only appropriate in the case of official misconduct (60 percent). The governor won 72 percent of this group. And it’s worth noting that a third of those voters who said “official misconduct” is a good reason to recall a governor voted to oust Walker, who has seen six of his staffers charged with 15 felonies in the “John Doe” probe. While Walker himself has not yet been charged, reports suggest that the investigation is circling closer to him. Over the past seven weeks, he transferred $160,000 from his campaign funds to a legal defense fund, according to the Milwaukee Journal-Sentinel. In a recent interview with AlterNet, John Nichols, associate editor of the Madison Capitol Times, noted that the governor “is now represented by four separate law firms, including two of the top criminal defense law firms. These aren’t firms that deal with election law; these are firms that deal with major crimes.” He survived the recall, but his problems are by no means over. 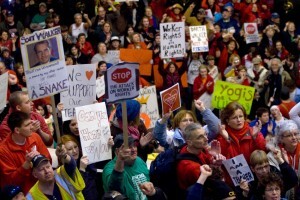 Also belying the spin that this was a referendum on public sector unions is the fact that the wealthiest fifth of the population – the people who have benefitted directly from Scott Walker’s tax cuts (passed during a supposed “fiscal crisis”) and probably worry too much about the social safety net he has ripped apart – made all the difference in the race. Scott Walker and Tom Barrett were tied among the 80 percent of Wisconsin voters who make less than $100,000 (Walker got 50.2% of the vote, but the poll has a 4-point margin of error). Among the 20 percent who make $100 grand or more, Walker trounced Barrett, 63-37. Did unions fail to turn out the vote? No, a third of the electorate belonged to a “union household” – the biggest share in any gubernatorial or presidential race since 2004. But much has been made about the fact that Walker won 38 percent among that group. It’s a sad reality, but a little too much is being made of it, when you dig into the numbers. As the Washington Post noted, union members voted overwhelmingly for Barrett – by a 71-29 margin. But members of “union households” who don’t belong to a union only supported Barret by a 51-48 margin – not enough to make a difference. 4. How Could it Be a Referendum on Union Rights When Nobody Ran on Union Rights? A slim majority of voters approved of Walker stripping the rights of public sector unions. But a final nail in the coffin for the narrative that Walker won on that issue is the simple fact that Barrett chose not to campaign on it. In fact, Barrett touted the fact that he wasn’t labor’s first choice (unions had backed Former Dane County Executive Kathleen Falk, whom Barrett defeated in a primary) and bragged on the campaign trail about how he had been a tough negotiator with public employee unions as mayor of Milwaukee. He presented himself as the centrist who can “make tough choices” – basically parroting the case that Walker made in 2010. That may have been a huge tactical error – hindsight is 50/50 – but it is the case, and suggesting that this election was all about Walker’s union-busting is simply divorced from the reality of the campaign. It’s not accurate to say that money made all the difference in this race. The two candidates, facing off for the second time in two years, were both well-known by the electorate and the overwhelming majority of voters had made up their minds before the battle commenced. But it’s also a mistake to dismiss the Walker camp’s ability to outspend their opponents by a 10 to 1 margin. According to the National Journal, the result was that “Walker and his Republican allies have outspent Democrat Tom Barrett and supportive groups more than 3-1 on TV ad buys during the three months leading up to the June 5 recall election.” This is likely the new normal in the age of Citizens United. Pundits have to blather about what a big contest means, but the reality is that there wasn’t much difference between this contest and the last one between the two men in 2010. Barrett’s financial disadvantage made it harder for him to get his arguments out, and again, he chose not to run on the very issue that led to the recall in the first place. As a result, the election was a mirror image of 2010, only with more voters going to the polls. Both Walker and Barrett won virtually the same share of the demographics they each held in 2010. Nobody can know whether Barack Obama would have had an impact on the race had he chosen to campaign for Barrett. He didn’t. If he had, one might have some reason to suggest that this race was a harbinger of things to come in Wisconsin in November. As it stands, 51 percent of those voters polled said they’d vote for Obama if the election were held today, compared with 44 percent who’d cast their ballot for Romney. Walker won 18 percent of likely Obama voters. None of this is to suggest that Tuesday wasn’t a painful defeat for the forces of progress in Wisconsin. It was. But much of the coverage has focused on Tuesday’s races in isolation, and that’s a mistake. 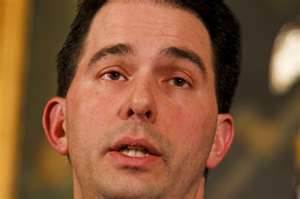 The picture looks a lot rosier when one considers the entire 16 months Scott Walker has been in office. Since Walker’s draconian union-busting measure passed, Democrats have collected the scalps of four sitting state senators, flipping the upper chamber to their control. 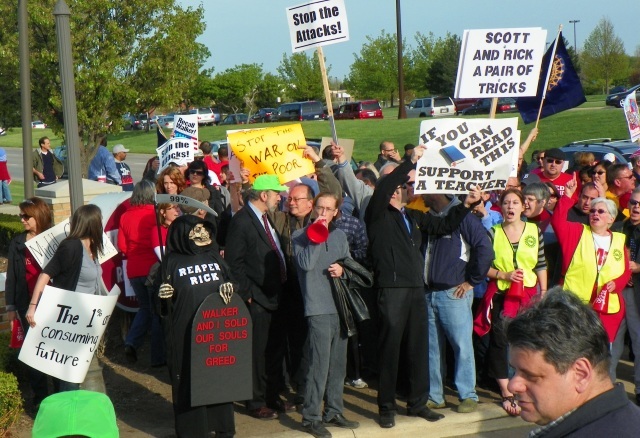 Three Democrats defended themselves against Republican recall efforts in 2011, while defeating two of their opponents. Then, back in March, another Republican targeted for recall, Pam Galloway, abruptly resigned, leaving the senate evenly split between the two parties. At the time, she said she was stepping down to deal with “family issues,” but it was widely believed that she didn’t have the desire to face a tough recall fight. All nine races in 2011 had been carried by Walker in 2010, but Democrats won five of them. The recalls sent an incredibly powerful signal that a majority in Republican-leaning districts had opted against the policies of the government. What that did when a new Senate was constituted after the recalls was that it convinced a moderate Republican to begin to side with the Democrats on some fundamental environmental issues as well as voting rights issues. The battle with Scott Walker, a recently elected sitting governor with almost unlimited resources, was always a David vs. Goliath affair. Progressives didn’t pull out a shocking victory, but they have still accomplished something pretty amazing in Wisconsin. More importantly, the fight isn’t over yet.